24 cms at Koyna, 19 cms at Tala, 18 at Murud, 13 at Ratnagiri, 11cms at Mumbai Colaba and S'Cruz. These are some of the heavy rainfall figures from the Konkan region as on Sunday morning. These may not be exceptionally high, but worth the mention as the development towards this sudden rainfall is worth a study and mention. To start with, Vagaries had put up a note just last night (Saturday 16th) of the possibilities of the west coast off shore trough re-organising and strengthening from next week, i.e. earliest could have been Monday 18th. Late (Saturday) sees the pressure fall at the 700 hpa, over the South Gujarat coast, and form a UAC. Coincidently, the sea level pressure along the North Konkan coast started falling, and reached a nadir of 997 mb at 5.30 a.m.(also mentioned by a reader). At the tropospheric level, a vortex ran down from the South Gujarat vortex, to form another "thin" vortex along the Konkan coast. (Seen on the map). This development "occured" at approximately 2.30 a.m. Sunday, as the winds changed from South to North in Mumbai. The natural result of all this was quick clouds forming along the off shore trough around the vortice. The Gujarat UAC is expected to survive, and the temporary "thin "vortex along the Northern Konkan coast was too weak to stay put. Hence, i estimated, in the morning flash, the heaviest of the rains for Mumbai from this to occur before afternoon time, Sunday. Predictions can be made and calculated as per the synoptic situations, but quick, fast and contrary developments and changes are very difficult to estimate. Most of the forecasters fumbled on this as far as the timing was concerned. Many a times, different models calculations and estimates differ. Outlook: UAC will precipitate rains over the North Gujarat ,Saurashtra peninsula and adjoining Kutch on Monday, and move west. If the system persists over the region, maybe for a day , the rains will naturally linger on over Gujarat for an extended time. It could be a possibility now, that this system could bring some rains to the Sindh coast from Monday/Tuesday. Expecting, and hoping, Karachi to receive its monsoon rains from this system early next week. Meanwhile, the precipitation along the monsoon axis (with UAC embedded) would be heavy over the M.P. region. North M.P. can receive heavier rainfall of up to 100 mms on Monday. Region around Sagar in M.P. seems to be vulnerable. The Konkan region precipitation will return back to "normal". Mumbai Colaba received 111 mms and S'Cruz 106 mms till 8.30 am Sunday, most of it after 3 am Sunday. Panvel measured 70 mms up to 8.30 am Sunday. 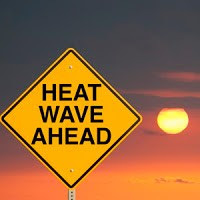 During the day on Sunday, Colaba measured 22 mms and S'Cruz 24 mms. For Monday, i would estimate a normal monsoon day. Cloudy with 4/5 showers and strong gusts during the showers. Bright intervals between showers. Rain amount 30-35 mms. Viewing and seeing the present situation, would estimate a reduction in rains intensity (with sunny intervals) Tuesday and Wednesday. Rainfall total at Colaba: 1114 mms. and S'Cruz 1455 mms. Last year, 2010, on date 16th July it was 1389 mms and 1383 mms resp. Pune: Due to moisture incursion, i estimate some showers in Pune in parts on Monday and early Tuesday. A showers in some areas could be moderately heavy. Raiin amount 10-15 mms. Reduction in rains from Wednesday. Dear Rajesh, I think you given a very plausible explanantion for the turn of events 'overnight'. but what puzzles me is the exceptional heavy rains in karnatak ghat areas , while it was medium in Konkan ghat areas , would like to have your thoughts on this . ananth: I did not stress upon the Off shore Karnataka region. 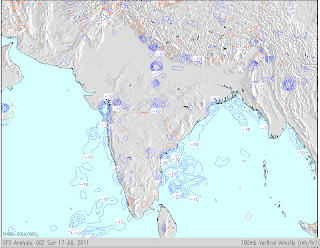 You will notice, in the map on blog, a small vortex (Localised i would say) of -10 off the Karnataka coast.Same time i had noticed a stream of rain clouds on the satellite image yesterday rushing into the Kar.coast.Surely,i had imagined then that heavy rainfall prone ghat regions would be getting substantial rains. It was ,in short, part of the re-organising of the off shore trough. Ananth, not possible to explain everything on blog..so more on Mumbai regions, generally. Cmdr Potey: Your hunch could be true. On specific request, can elaborate regional events and situations, as per my understanding and knowledge. Thanks Rajesh , That was useful . @Rajesh, That is very good analysis. All this weather events happend 36 hours earlier than most forecast model forecasted. But I still think mumbai might get another 100mm rains till wednesday as we already got 150mm yesterday. This is just my amatuer views. Rajesh, today morning's (00z) GFS model runs show a Low forming over North Gujarat - Saurashtra by tomorrow i.e. Tuesday. Both the 500mb and 850 mb maps show the forming of the Low. What it means is that the UAC that you have mentioned is forecasted to stay put and deepen into a Low by tomorrow. Could bring heavier falls to the Gujarat / Saurashtra region. Meanwhile the precipitation forecast for Mumbai is in line with your views, reduction in rainfall from today evening (as compared to the weekend) and as rightly mentioned by you "returning back to normal July rainfall" - which should be around 25 - 40 mm daily on an average. Meanwhile, came across a strange news article today in TOI, it says that 13 million cubic litres of drawable water is required by the end of Sept. for Mumbai to last out the dry season, currently it stands at 4.8 million cubic litres. Not sure we will recieve that much rains now on to nearly triple this count. Do these numbers make sense? What's an East-West shear zone and how does it affect the weather aorund it? The morning's bulletin by IMD talks about the shear zone having been established at 21 degrees North. The 00z runs of the GFS forecast of today morning for precipitation indicate extremely heavy rains for Mumbai for the 24 hrs. ending at 5:30 AM tomorrow morning. Meanwhile the UAC over Gujarat seems to have maintained itself. Andheri West by the way had a very heavy shower from 9:30 am - 10:30 am today. Looks like the relatively drier weather for Mumbai is still 1-2 days away, although I think there wasn't much rain overnight in Mumbai. There is plenty of clouding at head bay . Has a low formed there ? ^^^ i Agree..it looks like a low pressure has formed in northwest BOB...or is it just a UAC? ?Can u confirm this rajesh?? Ananth,Anonymous: There is no low pressure nor UAC in the Bay as on 19th.